Luis Buñuel’s 1962 film “The Exterminating Angel,” a surreal, bleakly comic yet disturbing fantasy, would seem to be about feeling trapped. An aristocratic couple invite a group of friends to their mansion for a post-opera dinner. For inexplicable reasons, both the hosts and the guests find themselves unable to leave the salon. The composer Thomas Adès has his own take on Buñuel’s classic work, as he explained in interviews when his opera “The Exterminating Angel,” based on the film, had its premiere at the Salzburg Festival in 2016. To him, the guests suddenly experience an absence of will. What gets exterminated by some force — either internal, imposed or both — is the will to act. That theme came through powerfully in this stunningly inventive opera when it was performed at Salzburg. It came through even more viscerally on Wednesday, when the work had its American premiere at the Metropolitan Opera, with Mr. Adès conducting. The opera has discomforting timeliness at this moment, when many Americans feel trapped in partisan battles over elites, economic justice and borders; yet the will to change things is somehow lacking. Buñuel’s film has almost no music. 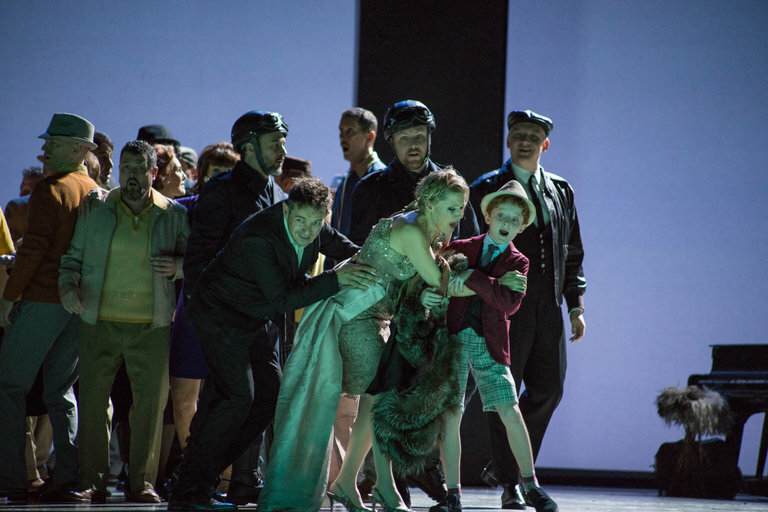 In this audacious opera — for which Tom Cairns, the director of the production, wrote the libretto in collaboration with Mr. Adès — the music digs deep. Mr. Adès’s wild, searing score explores the emotional undercurrents of the story and fleshes out the horror of the characters’ situation. The effect here is compounded by a prankish touch in Mr. Cairns’s brilliant staging. The set (by Hildegard Bechtler, who also designed the costumes) shows a salon, with fine couches and glittering tables, framed by a large wooden structure that resembles an opera house proscenium. Only when the guests arrived onstage did the chandeliers in the Met’s auditorium start rising to the roof. Opera audiences are always trapped, in a sense, during a performance. On this night, for this opera, even more so. It’s as if Blanca is searching through music’s past for clarity and willpower, yet speaking in a confused modern voice. 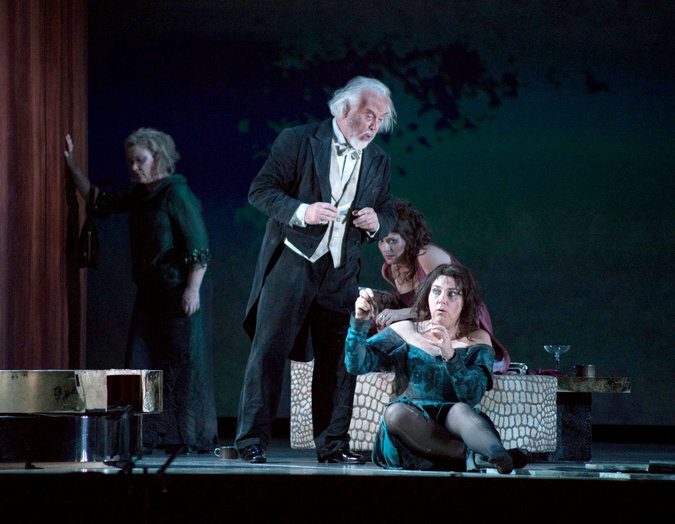 Blanca arrives with her husband, Alberto (baritone Rod Gilfry), a conductor, and Liticia’s colleague, who proceeds to fall asleep on a couch while confusion reigns. The anguished scene that will stay with me for a long while came late, a moment of motherly longing, when Silvia, now grimy, haggard and delirious, thinks about her little boy. She sings a fractured lullaby while caressing the head of a dead sheep (and how actual sheep come into the picture, I won’t give away). Silvia sounds as if she is recalling some distant, old hymn tune. Yet the disjointed orchestra grovels ominously in its depths while miniature violins play weirdly high, skittish sounds.